There are several types of entrances for your home. These types usually include a utilitarian entrance, special-purpose entrances, and a formal entrance. 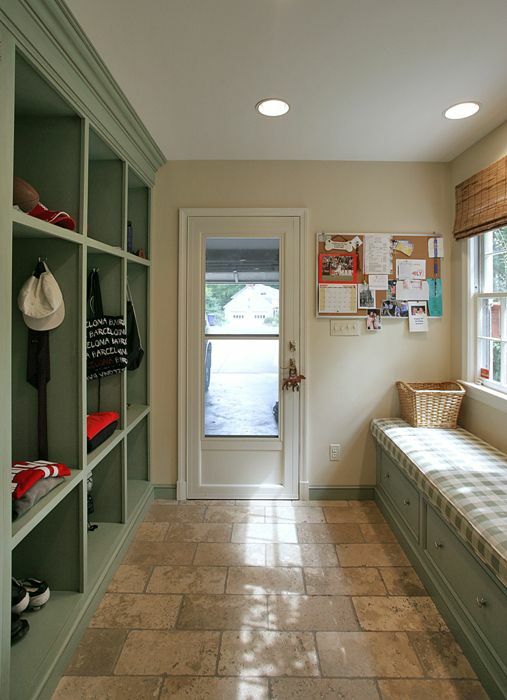 The utilitarian entrance to a home is more of a service entrance and one that is used multiple times daily. This entrance is usually connected to the driveway and carport/garage area and near the kitchen. The special-purpose entrance is usually connecting a space like your bedroom to something like a patio. However, this week we want to focus our discussion on perhaps the least used entry in your home: the front door and the foyer. The formal entrance is seen from the street and drive up to your house. 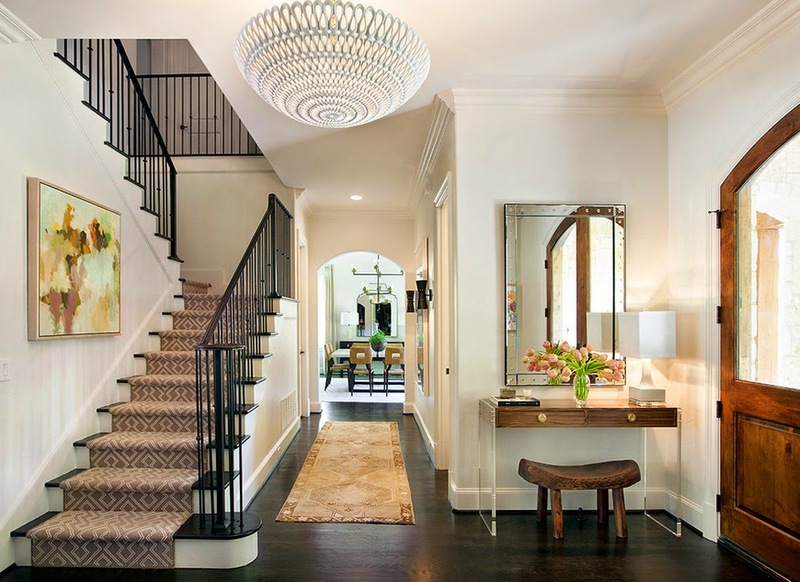 It almost always includes a foyer and is the first impression for the design of the rest of your home. This is the room where you want to receive your guests. The foyer is hardly ever the most utilized space in your house, but it is still a very important part of your home. 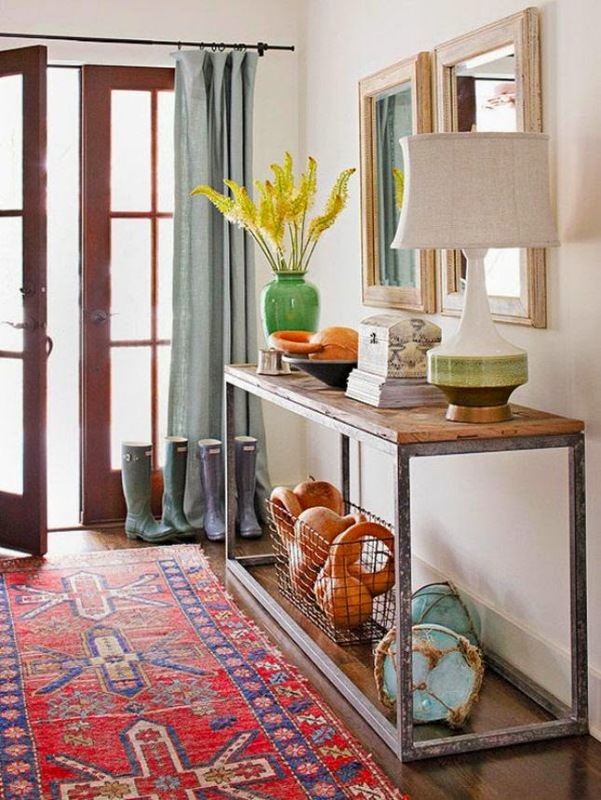 As the first room that your guest sees, its important to have a foyer that makes a statement. It’s an introduction to the rest of your home and is a good area to define your style. Its like going on a date, and you put on your nicest dress for the occasion. 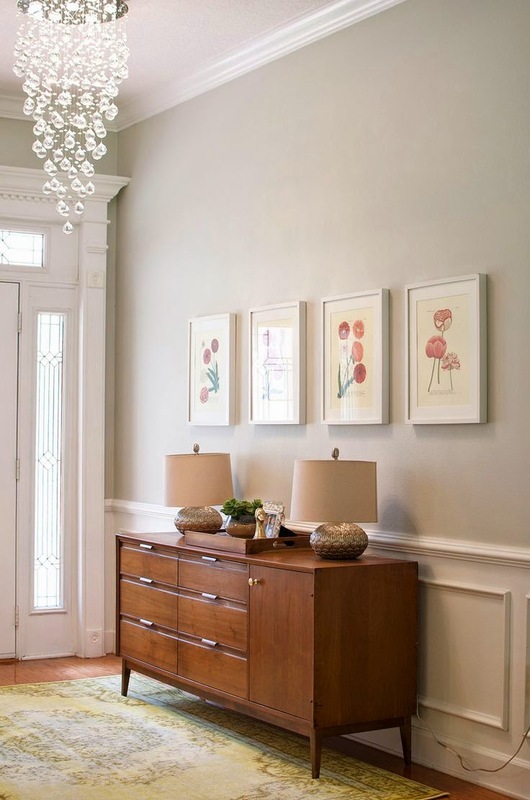 Because of this, the foyer is typically more formal than the rest of your home. Colors/textures that speak to the rest of your home. TIP: be conscious of balance and scale! 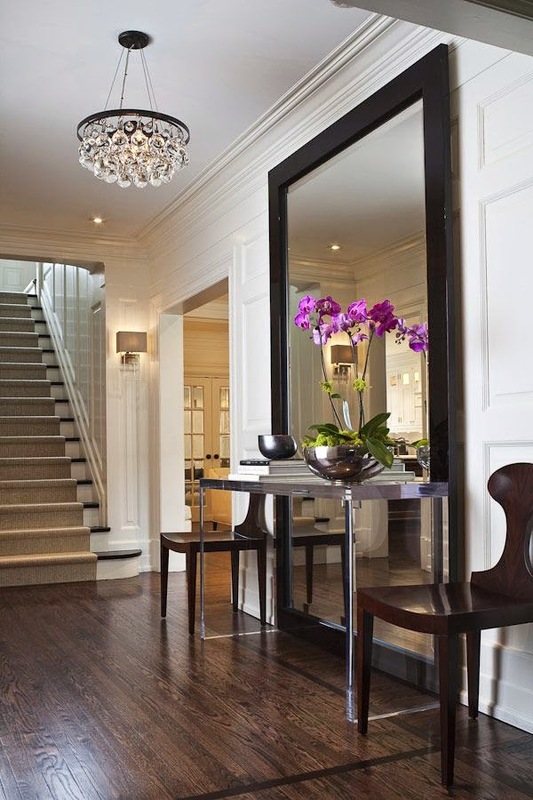 The foyer above is very rich and heavy with its dark tones which is nicely balanced by the delicacy of the mirror and the thin glass top table. The white flowers provide an organic and feminine touch. The large scaled mirror is cleverly and slightly tucked behind the console table,which gives a nice, well thought out layered look. 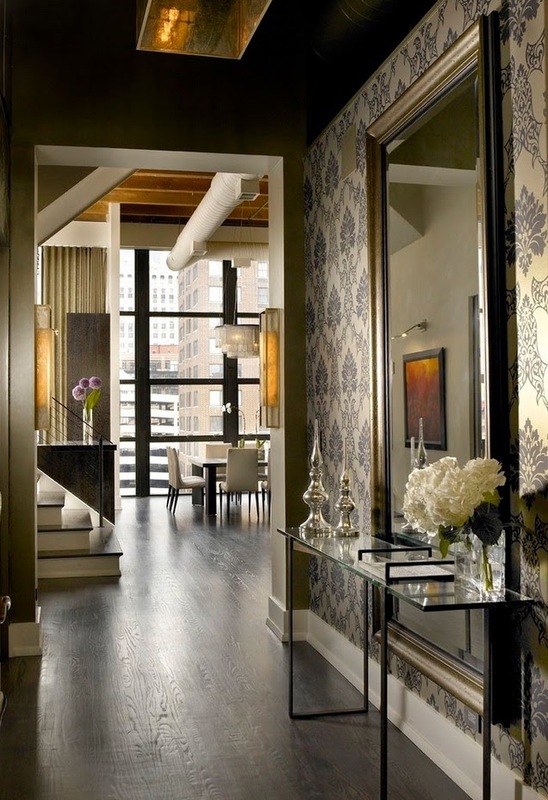 Mirrors in a multifunctional foyer, like one in an apartment can give the feeling of openness, especially where natural sunlight or windows are not present. 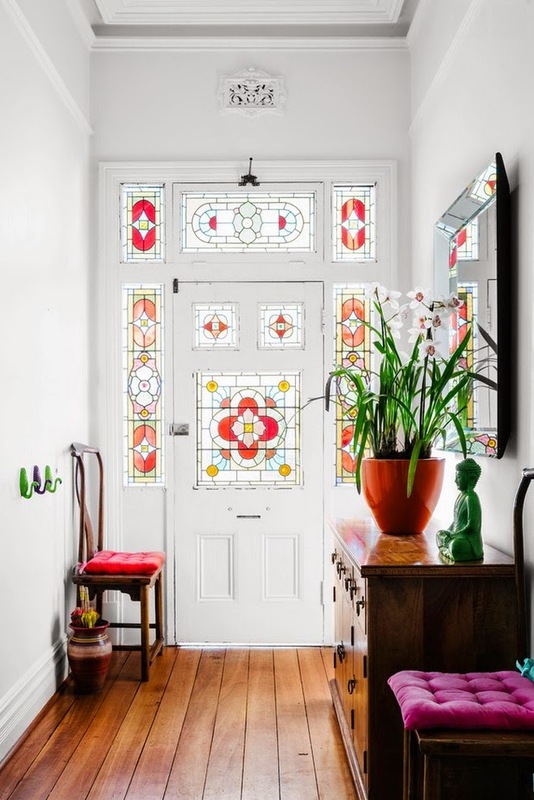 Foyer mirrors are also good for those last minute checks of appearance before leaving the house. There is a large chandelier centered to the space which grounds the room. 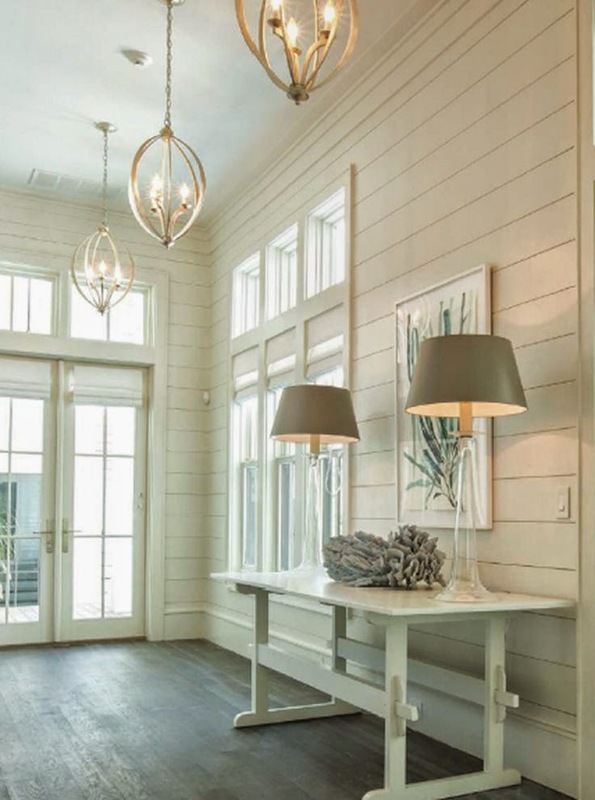 This foyer has a lot of “WOW!” going on! 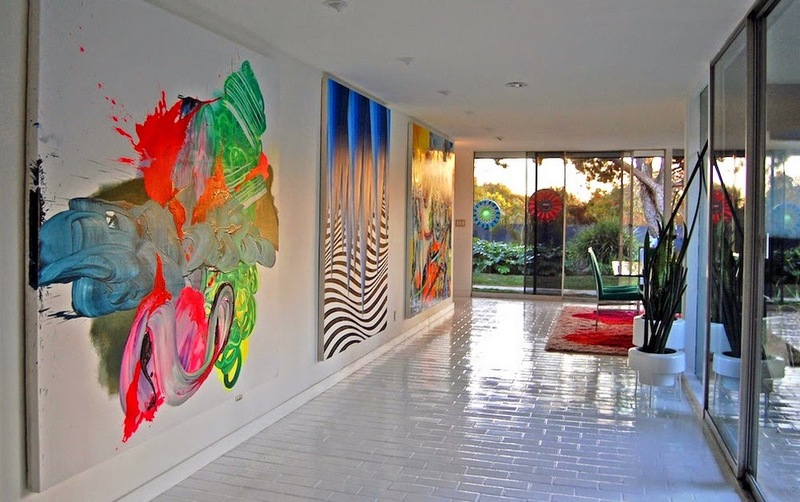 This foyer is actually a part of a designer showhouse which means the designer has “unlimited freedom” to design how they please. (click the source button for information on the designer). 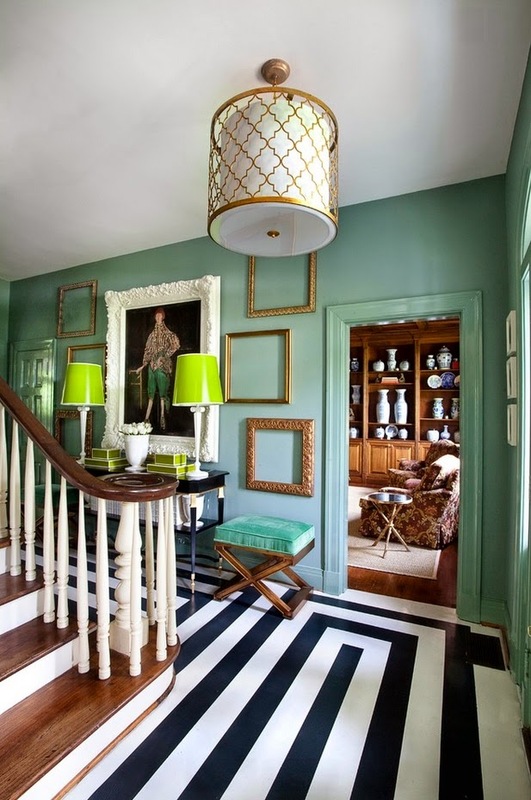 The most obvious features in the foyer above is the bold use of color and pattern. The green wall color is quite soothing and is juxtaposed and interestingly complimented by the black and white linear floor. There is a large gold pendant that hangs center to the entrance and bright green lamps which allow for ample lighting. The lamp color is playful, interesting, and bold. Because the wall color is muted, the lamp color works well. Centered between the lamps is a work of art which acts as the focal piece. The foyer above also has bold colors, but they are a little more subtle than the last foyer but still as impacting. The colors red and yellow are powerful colors that are used all the time in advertising and logos, and as you can see, decor. The large painting is centered above the yellow hairpin leg table with some lovely green plants. 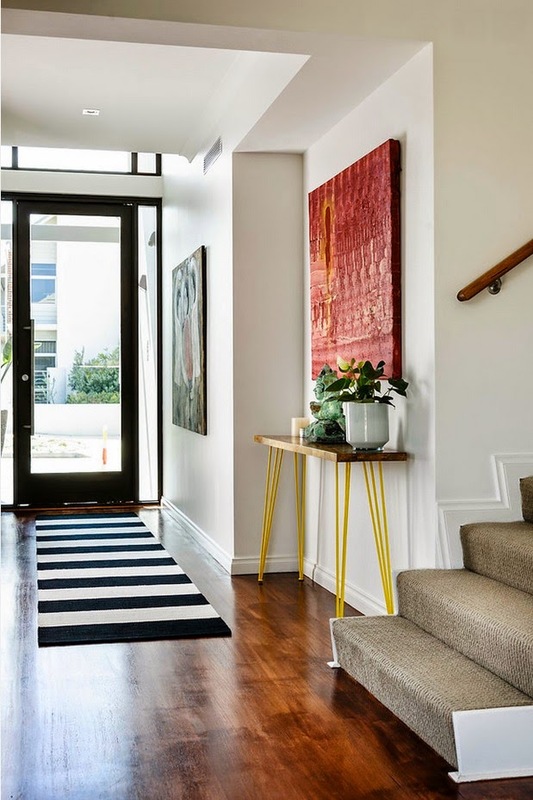 The rug (comparable to the black and white floor from the foyer above) is long to connect the door to the rest of the space. The horizontal stripes almost resemble steps, bringing you into the room. Above is a very light foyer with lots of jewel tone pops of color. See the mirror above the dresser, with seating beside and across from it providing a nice balance. 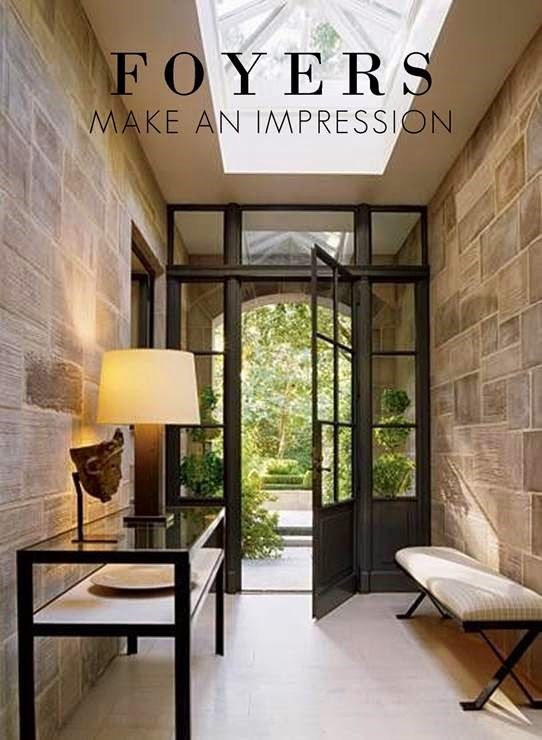 A foyer allows for a a windowed front door because it acts as a privacy buffer to the rest of the home. With a windowed front door, passerbys can see into your home but they only see the one room, and not at you and your activities. There is usually a large light fixture center to the foyer, but in this particular foyer there is a row of large pendent lights. The array affect of the lights is very successful because the space is more long and narrow (which most foyers tend to be).